The following is based on submitter’s own research. This piece is not the opinion of USA Gymnastics, and USA Gymnastics has not verified the facts contained within. Long ago, my college coach made an off-hand remark that the skill I just learned on the trampoline was a “B skill”. It made sense to me at the time. It was the mid-1970s, and trampoline had only recently gone away as an event in college gymnastics. All I knew of difficulty was that there were A, B, and C skills, and you needed so many of each in a routine. Difficulty was a big part of your score. In 2007, I started coaching trampoline, and difficulty was different. It was a numerical system called “axial rotation difficulty”, arrived at with a little algebra starting with the number of rotations and twists in a skill, or skill complexity. I just assumed that it had been an ABC ordinal system before, and then changed at some point to the numerical system. I knew there had been advocates for radical changes in scoring for artistic gymnastics, and I reckoned that such a movement might have succeeded in trampoline. Years later, I got curious about when such a change might have happened, but when I asked questions, I got conflicting answers. A few people remembered ABC trampoline difficulty, while others insisted that it had always been numerical. The story turned out to be more interesting and complex than I expected. Formal difficulty arrived in the 1960s for both gymnastics and trampoline. It turned out that there were actually two systems of difficulty for trampoline, but it was never a case of one replacing the other. The two systems were created at almost exactly the same time, and lived side-by-side for many years. The axial rotation difficulty system was invented in 1965 by Rockford, Illinois coach Bob Bollinger, and immediately adopted by the fledgling International Trampoline Federation (FIT) (Nissen-Munn, Dagmar, Date Unknown C). The formal ABC ordinal system was written for artistic gymnastics by the International Gymnastics Federation (FIG) in 1962, and first used in the 1964 Olympics (AAU, Unattributed, 1962; FIG Technical Committee, 1964; Grossfeld, Abie, 2014). That makes the ABC system a little bit older for artistic gymnastics. However, from 1965 to 1978, it was used for domestic trampoline competition in the USA, in college, high-school and even AAU gymnastics programs. All of this was happening against a backdrop of the politics behind governing the sport. Prior to 1954, the number of events considered to be part of gymnastics was very large (Grossfeld, Abie, 2010). The US colleges and AAU had a greater diversity of events than Europe, and had recently added trampoline. In 1954, the FIG moved to restrict the events that are part of gymnastics to the current men’s and women’s events, starting with the 1956 Olympic Games (Grossfeld, Abie, 2014). The US gymnastics community did not embrace the new Olympic model immediately, and retained many of the non-conforming events into the 1960s and 70s. Meanwhile, George Nissen was busily promoting trampoline competition overseas and had great hopes that trampoline would be part of international gymnastics (Munn, Ron, 2015). His hopes were dashed in 1961, when Rudolph Spieth formally proposed that the FIG should add trampoline to the Olympic events; the FIG voted 11-1 against (FIG, 2013). From that point on, if there was going to be international trampoline competition, it was on its own. Nissen responded by hosting the first World Championship in 1964 (Nissen-Munn, Dagmar, Date Unknown B), and founding the FIT in conjunction with that competition (Nissen-Munn, Dagmar, Date Unknown A). Within the USA, however, the colleges, high-schools, and AAU continued as they had, treating trampoline as just another gymnastics event. The other piece of the political backdrop is the battle within the USA for control of gymnastics between the college coaches and the AAU. In 1962, a group of US college coaches founded the U.S. Gymnastics Federation (USGF, now called USA Gymnastics), for the purpose of taking the national governing body role away from the AAU (Grossfeld, Abie, 2010). The new organization began running its own national championship (1963) as an alternative to the official (AAU) national championship. It looked a lot like the college program, and included trampoline as an event. The new organization also began immediately to write technical material for coaching and judging. It is in those early publications that we see the ABC trampoline difficulty for the first time. The first appearance of the ABC code for trampoline was in USGF Rules for Men, 1966 to 1968 (“U.S.G.F. Men’s Technical Committee,” 1966). The code included many skills that we would never see competed today, and listed combinations of skills that we would consider individually today (Figure 1). That difficulty code coincidentally appeared in the 1966 NCAA rules for men’s gymnastics (NCAA Gymnastics Rules Committee, 1966), and was adopted by the National Federation of State High-School Associations (NFSHSA- A USGF constituent). It appeared unchanged until 1969 in the college rules (NCAA Gymnastics Rules Committee, 1969), and until 1978 in the National High School rule book (Durbin, Brice, 1977). Figure 1. Trampoline ABC difficulty table from the 1975/76 National High-School Rulebook. Identical to (and cleaner than) the original in USGF Rules for Men, 1966-1968. The FIG had nothing to say about skill values on trampoline; that extension to trampoline was created in the USA by the USGF. However, in all of those publications containing the trampoline ABCs, no individual took credit for assembling that list. The clue to the author’s identity came from an earlier (1964) USGF publication, the Age-Group Gymnastics Workbook. While the book did not include anything about difficulty, the book’s forward credits the trampoline sections to coach Glenn Wilson, who was also on the NCAA rules committee in the mid-1960s. I had an opportunity to interview Glenn Wilson recently, and he verified that indeed, he was the author of the ABC trampoline code that was used in the colleges and high-schools (Wilson, Glenn, 2018). It made perfect sense. Axial rotation was just making its appearance internationally, so it was not well known, and there was a need for a set of difficulties that allowed trampoline to conform to the same rules as the other men’s events. That way, the same judges who were scoring rings and pommel horse could easily score trampoline. 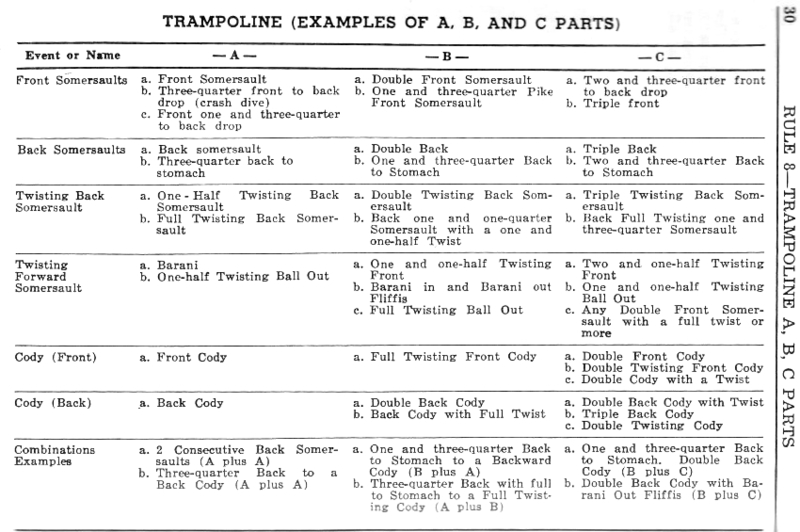 The AAU briefly published an ABC code for domestic trampoline in their 1969 book “Gymnastics Rules 1969-1972”. It differed from the USGF ABC code in that it was formula or rule driven instead of list driven, attempting to capture the skill complexity aspect of axial rotation and convert it to ABCs for domestic use (Figure 2) (Wilderoter, Donald et al., 1969). That was the first and last time. In 1970, the USGF won its battle against the AAU, after it and the colleges dropped the events that did not conform to the 1956 Olympic model (including trampoline). Starting in 1970, the FIG recognized the USGF as the US governing body for gymnastics (Grossfeld, Abie, 2010). The AAU still had control of Trampoline & Tumbling, regulated internationally by the recently created FIT. They continued to publish T&T rules for the US, dropping all ABC difficulty in favor of the international system (axial rotation), until the US Congress acted in 1978 to strip the AAU of most of its constituent sports (Grossfeld, Abie, 2010). Just as Glenn Wilson was writing the ABC difficulty for US trampoline, Bob Bollinger was creating the system of axial rotation difficulty used in trampoline to this day (Nissen-Munn, Dagmar, Date Unknown). The system was used in the second Trampoline World Championship (1965), but only for the purpose of seeding athletes into the tournament style elimination. Figure 2. 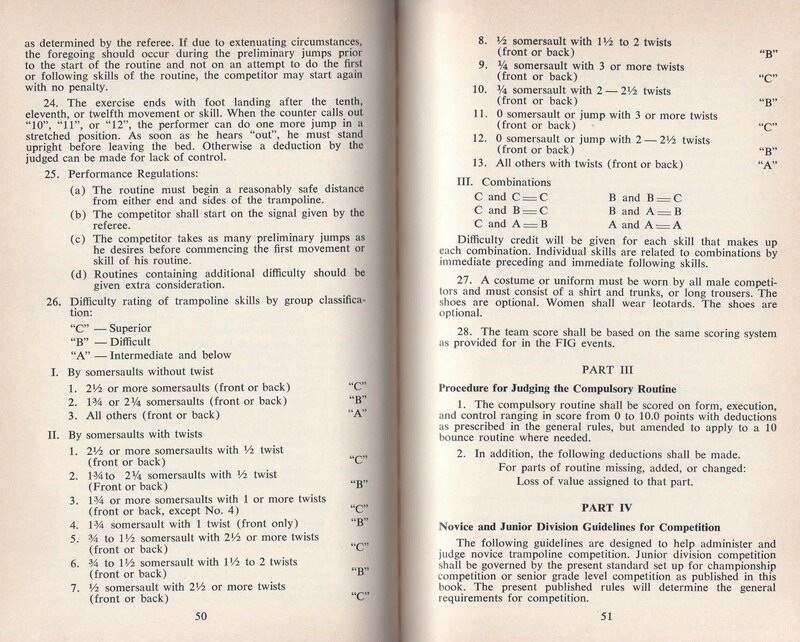 ABC trampoline difficulty from the AAU Gymnastics Rules 1969-1972. My journey through history has not ended, but I have reached a way-point. I did manage to reconcile my recall of trampoline difficulty having letter values with events in the past. The ABC difficulty for trampoline went extinct with end of high-school trampoline in 1978. Axial rotation difficulty lived on with minor changes over the decades, bringing us to where we are today. Behind it all was politics that resulted in trampoline being separated from gymnastics internationally, but for a time, remaining part of gymnastics domestically. The only people who would have seen both difficulty systems were high-level trampolinists and their coaches from the college program in the mid to late 1960s, and that is a small number. Accidents of history do funny things. The FIG finally embraced trampoline in the 2000 Olympic games, but I have to wonder what would have happened if the FIG had voted differently in 1961. Trampoline would have been adopted before the formal ABC difficulty code was written, and we would probably be using that ordinal difficulty system today. The axial rotation system might never have been created, or it may have simply been rebuffed the way other radical changes have been rebuffed in artistic gymnastics. Of course, if the FIG had embraced trampoline in 1961, we would not have the separate identity from artistic gymnastics that we have today. Acknowledgements. This work depended on discussions with a great many people who were part of the sport during the 1950s, 60s and 70s, including Fred Turoff, Abie Grossfeld, Dave Hirst, Ron Munn, Dagmar Nissen-Munn, Paul Swafford, Bob Hallwig, Paul Goodwin, Nick Orrick, Mark Pflughoeft, Pete Bauer, Don McPherson, Kurt Austin, Leigh Hennessey-Robson, George Hery, Rick Tucker, Tom Gibbs, Carl Schrade, Joy Umenhofer, Glenn Wilson, Pat Henderson, Horst Kunze, and Dave Ross. Many of those people went out of their way to either scan or lend written material from the time. I am also indebted to the rare books staff at the Milwaukee Public Library, for the endless stream of rule-books they brought me to scan. AAU, Unattributed, 1962. Amateur Athletic Union of the United States Gymnastics Guide, 1962-63. Official Rules, Men and Women. Amateur Athletic Union, New York, NY. AAU, Unattributed, 1958. Amateur Athletic Union of the United States Gymnastics Yearbook, 1958-59. Official Rules, Men and Women. Amateur Athletic Union, New York, NY. FIG, 2013. FIG Press Information Kit. 29th Trampoline Gymnastics World Championships, Sofia, Bulgaria, November 07 - 10, 2013. FIG Technical Committee, 1964. Code of Points for the atistic gymnastic competitions, at the World Championships, Olympic Games, Continental Championships and Games, and all other international tournaments. FIG Men’s Technical Committee, Translation by AAU, New York, NY. Grossfeld, Abie, 2010. A History of United States Artistic Gymnastics. Science of Gymnastics 2, 5–28. NCAA Gymnastics Rules Committee, 1969. The Official National Collegiate Athletic Association Gymnastics and Trampoline Rules, 1969-1970. College Athletics Publishing Service, Phoenix, AZ. AAU, Unattributed, 1949. Amateur Athletic Union of the United States Gymnastics Yearbook, 1949. Official Rules, Men and Women. Amateur Athletic Union, New York, NY. “U.S.G.F. Men’s Technical Committee,” 1966. U.S.G.F. Rules for Men, 1966-1968. United States Gymnastics Federation, Tucson, AZ. Wilderoter, Donald, Edwards, Vannie, Hardy, Jerry, Maloney, Thomas, 1969. A.A.U. Official 1969-1972 Gymnastics Guide and Handbook. Amateur Athletic Union, New York, NY.